I was very pleased with this year's party. We had about thirty people or more attend. We had a diversity of guests that impressed me: we had at least ten people who had never attended one of our parties, and another three who hadn't come to our parties in years. 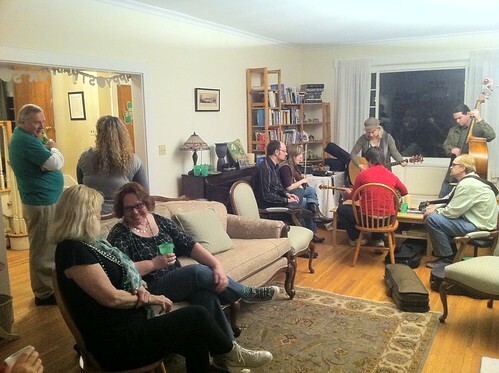 We had great music: Paul and Heather invited a few of their friends, and Jukka joined in, so we had a good jam going on most of the night. I had toyed with the idea of trying to play harmony with Garage Band on the iPad, but never found the time to do so. We had some gaming, which we don't always have. Austin, Kevin, and Joyce played a variety of games. Our new furniture arrived on Friday- at least, most of it. The new coffee table didn't arrive yet, but that probably made people less likely to eat food on the couch. People will eventually spill food on the couch, but we were glad that it didn't happen yesterday. And the old furniture seemed to work well as musical space. Gingerbread: not eaten. We should have cut it to start people eating it.